The researchers studied 7,752 pairs of identical and non-identical twins (a total of 15,504 children) from the Medical Research Council (MRC) funded Twins Early Development Study(TEDS), and found that the link between drawing and later intelligence was influenced by genes. 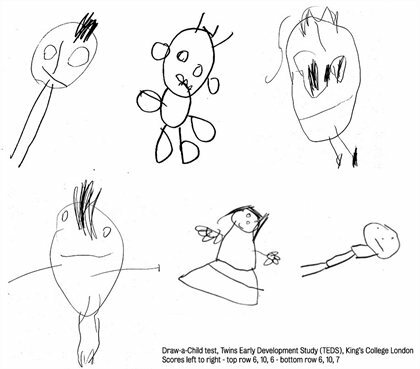 At the age of 4, children were asked by their parents to complete a ‘Draw-a-Child’ test, i.e. draw a picture of a child. Each figure was scored between 0 and 12 depending on the presence and correct quantity of features such as head, eyes, nose, mouth, ears, hair, body, arms etc. For example, a drawing with two legs, two arms, a body and head, but no facial features, would score 4. The children were also given verbal and non-verbal intelligence tests at ages 4 and 14. The researchers found that higher scores on the Draw-a-Child test were moderately associated with higher scores of intelligence at ages 4 and 14. The correlation between drawing and intelligence was moderate at ages 4 (0.33) and 14 (0.20). The researchers also measured the heritability of figure drawing. Identical twins share all their genes, whereas non-identical twins only share about 50 percent, but each pair will have a similar upbringing, family environment and access to the same materials. Overall, at age 4, drawings from identical twins pairs were more similar to one another than drawings from non-identical twin pairs. Therefore, the researchers concluded that differences in children’s drawings have an important genetic link. They also found that drawing at age 4 and intelligence at age 14 had a strong genetic link.